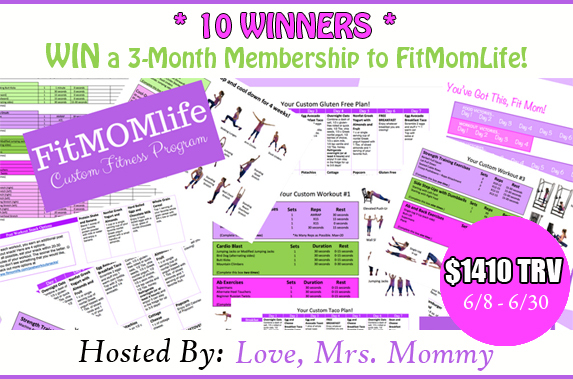 A 3-Month Membership to FitMomLife! FitMomLife is a custom fitness program that is perfect for those who don’t have hours to spend searching for healthy recipes, working out at the gym, or endless monetary supply to spend on personal trainers or dietitians. This one-stop site will get you motivated and moving in the right direction! FitMomLife knows being a parent means you might not have a lot of time for yourself… ahem… so they make the most of the time you do have! With customized meal and workout plans, and access to their team of personal trainers and registered dietitians, you won’t need to look anywhere else for the answers you need. Now that’s time saved, mommies! !